"Continue to ask, and God will give to you. Continue to search, and you will find. Continue to knock, and the door will open for you. Yes, if a person continues asking, that person will receive. If a person continues looking, that person will find. And if a person continues knocking, the door will open for that person." Ask, look, knock. These actions sound so harmless and so easy. But behind these words is the intent of Jesus: "Be persistent! Keep asking! Continue looking! Don't quit knocking!" This is not a cookbook prescription, but the target attitude we should have in our prayers and our lives. We must be persistent and faithful. 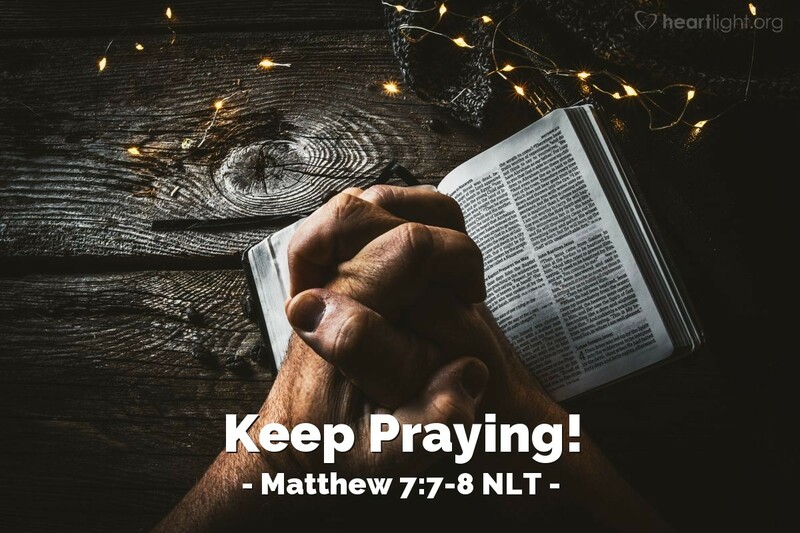 But before making that persistence our key to acquiring and achieving for ourselves, let's remember Jesus' example in the model prayer in Matthew 6:9-13: the focus is on God's will—his Kingdom and his glory, on our most basic needs—daily bread, and on overcoming sin through forgiveness and deliverance. Jesus is reminding us that if we stay after these, not only will we get what we ask for, but we will also be changed in the process! Holy and righteous Father, thank you so much for the many prayers you have answered. Thank you, dear Father, for answering my prayers to be more like Jesus. I confess I am still so very far from his perfection, but when I look at the distance you have brought me in the past, I can view the future only with excitement knowing that you will lead me on to become more like him in the future. In Jesus' name, I thank you and ask for your continued grace. Amen.